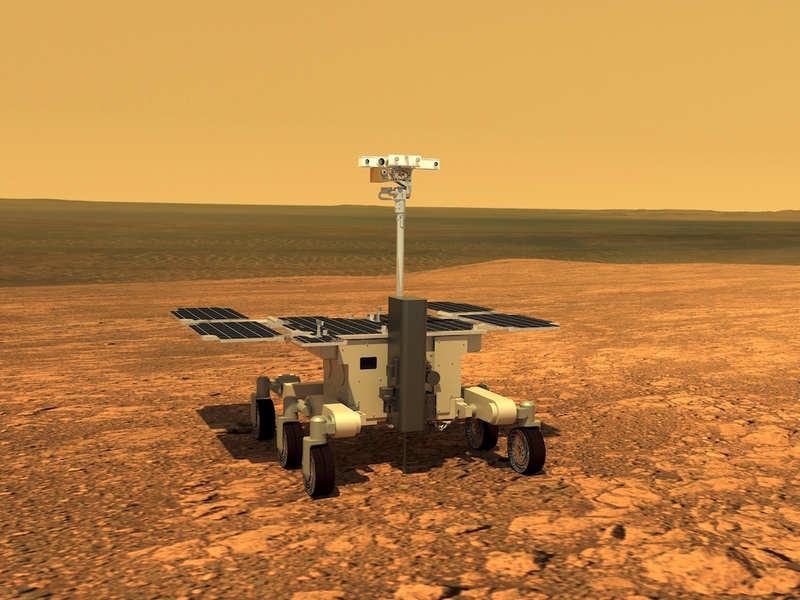 Aberystwyth University are manufacturing items of hardware for two of the ExoMars 2020 rover optical remote sensing instruments – PanCam and ISEM. The PanCam and ISEM calibration target is the reflectance reference standard for the PanCam and ISEM instruments. The colour patches are manufactured from coloured glass and the structure from aluminium. The PCT has dimensions of 67 x 76 x 18mm and a mass of 40g. The 6 small colour patches are for use only by PanCam, the two larger patches are for use by PanCam and ISEM. PanCam Calibration Target as viewed by the PanCam High Resolution Camera. Image credit Helen Miles. The Fiducial Markers provide geometric reference points on the top deck of the ExoMars rover. These will be used to confirm that the mast has unfolded correctly from its stowed configuration on the Martian surface. The 3 FidMs have dimensions of 32 x 16 x 6.5mm and a mass of 1.2g each. Fiducial Marker as viewed by the PanCam High Resolution Camera. Image credit Helen Miles. The Rover Inspection Mirror is a convex spherical mirror mounted on the rovers front left bogie suspension bracket. When imaged by the PanCam High Resolution Camera, the RIM will provide views which cannot otherwise be achieved – including the underside of the rover and the end of the drill. The RIM is 50mm diameter and together with its mounting bracket has a mass of 20g. Rover Inspection Mirror as viewed by the PanCam High Resolution Camera. Image credit Helen Miles.